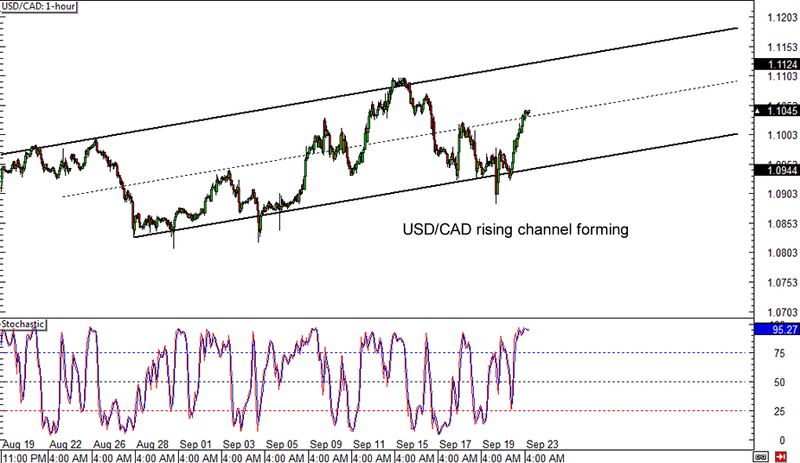 Let’s start off with this simple forex channel on USD/CAD’s 1-hour time frame. The pair appears to be starting a short-term uptrend, as price recently made higher lows and higher highs. Price just bounced off the channel support near the 1.0950 minor psychological level and may be headed for the top at the 1.1200 major psychological mark. However, USD/CAD seems to be having trouble extending its gains past the mid-channel area of interest since stochastic is already indicating overbought conditions. A selloff from this area could lead to another test of the channel support, which is closer to the 1.1000 level this time. Watch out, Kiwi bears! NZD/USD might be in for a strong bounce sooner or later, as price is currently approaching the rising channel support on its daily forex chart. This is somewhere around the .8050 to .8100 psychological levels, which might keep further losses in check. At the same time, stochastic is crawling out of the oversold area, indicating that Kiwi bulls might charge anytime now. If that happens, price might bounce to the nearby area of interest around .8350 or eventually make its way back to the channel resistance above .8800. Make sure you set a wide stop below the channel support if you’re thinking of going long! 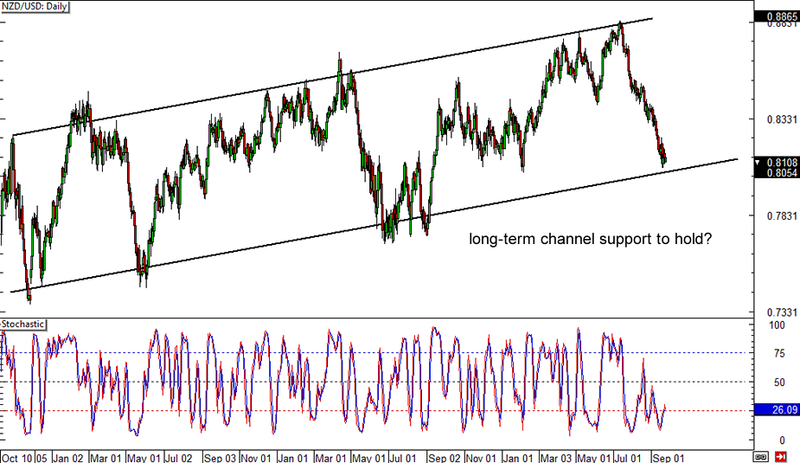 Here’s another potential long-term bounce on AUD/USD’s daily forex time frame! Price is also approaching a key support area and may cut its southbound trip short, especially since stochastic is showing that the drop is already overdone. As you can see, the long-term support zone around .8800 to .8850 has held for the past year and may continue to act as a floor for now. In that case, AUD/USD might pull up to the .9000 major psychological level, which has acted as an area of interest recently. 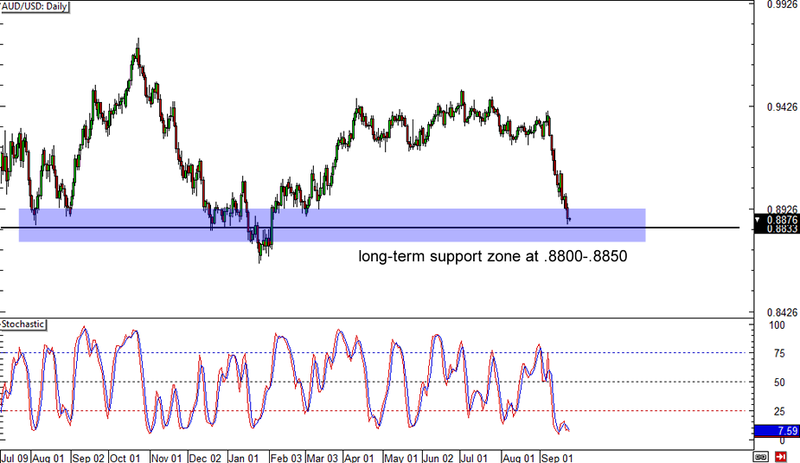 A stronger rally might even last until the .9200 former support zone, but a break below .8800 could be a sign that a deeper selloff is in the cards.